In 12-inch skillet, heat oil over medium-high heat until hot. Add bell peppers and onion; cook about 4 minutes, stirring occasionally, until crisp-tender. Remove from skillet. In same skillet, place uncooked pasta and seasoning mix (from Ultimate Hamburger Helper box), hot water, milk, thyme and pepper sauce. Heat to boiling, stirring occasionally. Reduce heat; cover and simmer 10 minutes, stirring occasionally. 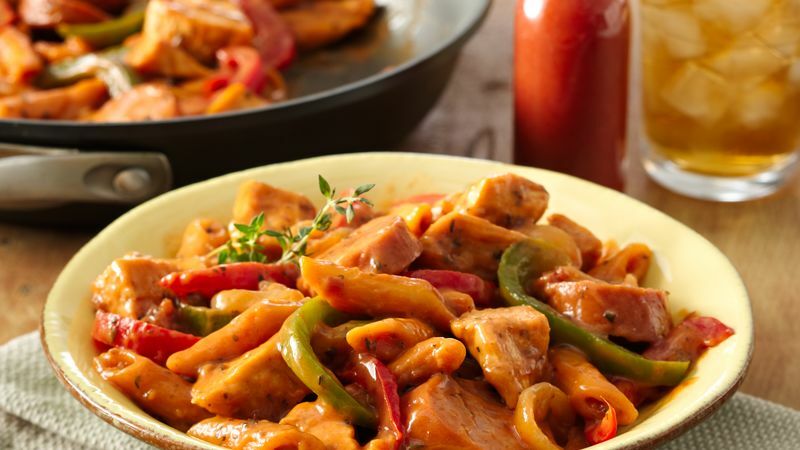 Stir in chicken, sausage and vegetables. Return to boiling; reduce heat. Cover; simmer about 8 minutes longer or until pasta and vegetables are tender. Remove from heat; stir in tomato herb sauce (from Ultimate Hamburger Helper box). Serve with additional pepper sauce, if desired. Andouille, a spicy smoked sausage, is often used in Cajun cooking. If you prefer a milder flavor, you can use kielbasa or any other smoked sausage for this recipe. Don't care for sausage? Omit the sausage and double the chicken, or add 1 1/2 cups cooked shrimp instead.